One of the biggest losses for the third-party is the ability to stream tweets. What this means is that previously, these apps did not require users to have to swipe-up to refresh their timeline. Instead, the timeline would refresh itself automatically. However, there is still at least one way to get streaming on your timeline, not so much through Tweetbot or Twitterrific, but through the TweetDeck Mac app. The app does allow users to streamline tweets in without having to refresh the timeline manually. The only bad thing is that there is only one app that will allow you to do so. With that said, the TweetDeck app for the Mac has not been updated since July 2015, so obviously it will not be perfect and there could be bugs with the app too. Of course, you could always use the official TweetDeck website too to stream tweets. This is merely for those who are looking for an app to do it in. It should also be said that the app does support the 280 character limit. The images of the app in the Mac App Store only show it to support the old 140 character standard, but like the Twitter website, it has been updated to support the new standard. 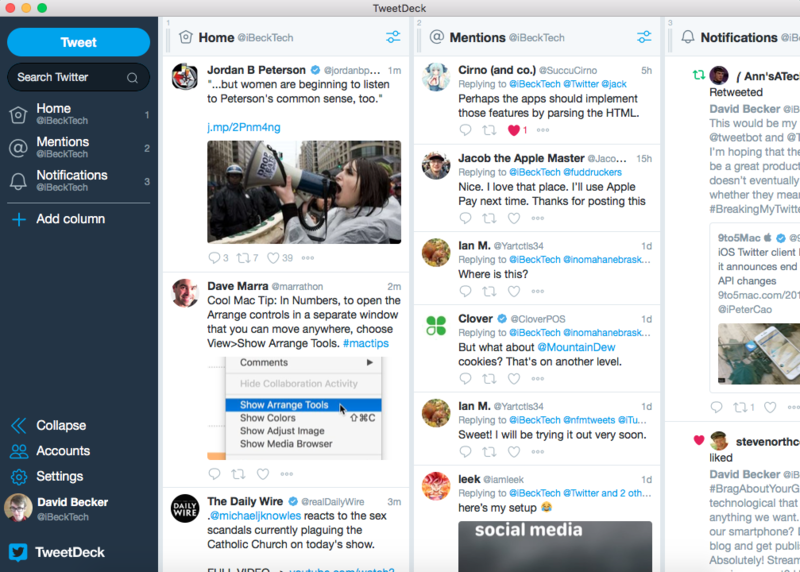 TweetDeck is a free app in the Mac App Store and will allow you to get all of your streaming needs for those who still want to be able to stream tweets.